The story of I am a Holocaust Torah begins in Czechoslovakia over 50 years ago. The Nazis storm through Moravia, Bohemia and Slovakia like a tornado, destroying synagogues and lives in their path. In the process, among the items they took are Torah scrolls and adornments such as mantles, crowns and breastplates. These are taken to Prague, the country's capital. By the end of the Second World War, 1,564 Czech Torahs had been stolen by the Nazis and lay forgotten in Prague. Twenty years later, the scrolls were negotiated with the Czech authorities and transferred to the Westminster Synagogue in London, where some of them are displayed to this day. This is the historic and dramatic story of the rescue of 1,564 Torah scrolls after they had been forgotten in Prague for years. 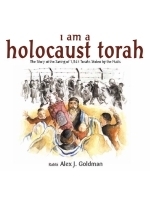 I am a Holocaust Torah is the historic and dramatic story of the 1,564 Torahs through the mind, heart and words of one of the Torahs itself. This holocaust account is uniquely told from the point of view of a personified Torah. Using a Torah to narrate the story enables Rabbi Goodman to present the emotive content of the holocaust in a profound way to children of all ages. I am very, very old. I was very tired. Now I am alive again. Some Torah's are more handsome than others, depending on the script crated by the sensitive, loving, religious hand that carefully and lovingly stroked the letters onto the parchment. I used to be handsome. No more! Now I have scars, burns, tears. Part of me is waterlogged. I was not kept dry.